AZUSA — A man arrested earlier this week on suspicion of kidnapping a female friend was released from jail Wednesday after prosecutors declined to file charges, officials said. Derrick Lee Zacheary, 61, of Los Angeles was released from custody early Wednesday after officials rejected the case against him due to insufficient evidence, according to county booking records and Los Angeles County District Attorneys officials. Azusa police arrested him Monday afternoon following an alleged incident 200 block of North Aspan Avenue, Azusa police Detective Robert Landeros said. The woman, who is in her 30s, is a friend of Zacheary who lives with him in a recreational vehicle, police added. The woman told investigators that Zacheary locked her in the back of the RV and brandished a gun, Landeros said. After driving to Los Angeles, Zacheary was accused of unlocking the back of the RV, at which point the woman ran off and went home, police said. A handgun was recovered when police took Zacheary into custody, Landeros added. Zacheary told police he had been hired by a property manager to keep watch over a home on Aspen Avenue, Landeros said, and that the woman wanted to go back to Los Angeles, but Zacheary didn’t want to give her a ride. Prior to being released without charges Wednesday, Zacheary had been held in lieu of $100,000 bail. SANTA FE SPRINGS — A drunken driver is believed to be to be responsible for a crash that left a big-rig loaded with beer jack-knifed across the southbound lanes of the 605 Freeway Tuesday afternoon, authorities said. The driver of an Audi sedan that collided with the big-rig was arrested following the 1 p.m. crash on the southbound 605 Freeway near Florence Avenue, California Highway Patrol Sgt. A. Aleman said. His name was not available Wednesday, Aleman added. He was initially described as a 26-year-old South Gate man. The truck driver was not hurt, and the Audi driver was treated for apparently minor injuries, Aleman said. The Audi had just entered the freeway from a 5 Freeway transition road when it collided with the brew-hauling big-rig, which was already southbound in the No. 3 lane of the 605, officials said. The crash was being investigated by the Santa Fe Springs office of the CHP. SAN DIMAS — Sheriff’s deputies arrested a man and two women on suspicion of auto theft Wednesday after a woman spotted her own car, which had been stolen earlier in the day, driving on the 10 Freeway, authorities said. A woman had her Mazda Miata stolen Wednesday morning in Montclair, Los Angeles County sheriff’s Sgt. Kirk Smith said. As she was on her way to school on the 10 Freeway in another vehicle about 9:45 a.m., “She spotted her car driving down the freeway,” Smith said. The woman called deputies as she followed the car until it headed south on the 57 Freeway, exited at Arrow Highway and pulled into a gas station, Smith said. The car and three suspects were still at the gas station when deputies arrived, he added. The suspects were arrested without a struggle. The names of the suspects, who were turned over to Montclair police for booking, were not immediately available. A 5th grade teacher was arrested Monday for alleged sexual misconduct with a child. Roger Talley, 53, of Upland, was arrested and booked at the West Valley Detention Center on suspicion of one count of lewd acts on a child and on one count of criminal threats, according to a Chino police news release. Talley, who worked at Walnut Elementary in the Chino Valley Unified School District, had been the focus of a two-week investigation, officials said. During that time. Chino police detectives spoke with current and former students of the suspect, who was placed on leave from the school district on Feb. 10, according to the news release. Anyone with information about the incident can call police Detective Ted Olden at 909-464-0745. A Whittier man driving a BMW and his passenger were in custody Tuesday night after a chase that began in Hacienda Heights and ended in North Hollywood. The driver, Valentino Arroyas of Whittier, was booked on suspicion of felony evading, while his passenger, 20-year-old Janine Rodriguez of East Los Angeles, was booked on suspicion of possession of methamphetamine, Los Angeles County sheriff’s Lt. Victor Sotelo said. No one was injured in the incident that started at Colima Road and Hacienda Boulevard. Sheriff’s Lt. John Saleeby said the driver of a BMW ran red lights shortly after 8 p.m. The car didn’t stop and made a beeline for Whittier, where it was later determined the driver resides, officials said. The pursuit, which involved several law enforcement agencies, went through different communities including Whittier, Pico Rivera and Pasadena before working its way to North Hollywood. On surface streets the driver hit 35 to 40 mph and sped up while on the freeways. The chase ended about an hour and a half later on the 170 Freeway at Saticoy Street in North Hollywood, where the car ran out of gas, officials said. Arroyas and Rodriguez then surrendered to California Highway Patrol officers. Arroyas was thought to have fled, in part, because he incorrectly believed the car he was driving had been reported stolen. The owner of the vehicle, who is a relative of one of the suspects, had told them the vehicle would be reported stolen if not returned, Sotelo said. But that had not occurred. According to county booking records, Arroyas was being held in lieu of $35,200 bail, while Rodriguez was being held in lieu of $13,000 bail. Both were scheduled for arraignment Thursday in West Covina Superior Court. PICO RIVERA – A 17-year-old Pico Rivera boy was shot in the shoulder after a passenger in a sport utility vehicle fired several times at a group of teens Tuesday. The shooting broke out at 12:55 p.m. on Washington and Passons boulevards. Sheriff’s gang deputies believe the suspects are gang members. Sgt. Mark Bailey said the shooter shouted the name of a Pico Rivera gang before firing at two boys and two girls who were at a bus stop. But he said the victims aren’t gang members. Before the shooting, Bailey said a green Pathfinder stopped by the teens and the driver asked where they were from. The four denied being in a gang. It appeared the man left and returned a short time later with a passenger, investigators said. The passenger pointed a gun at the group, yelled out a gang’s name and shot three times. The injured teen ended up with a bullet lodged in his shoulder, however the wound did not appear life-threatening, Lt. Robert Smith said. The shooter was described as a Latino in his 20s with black hair that was slicked back. He wore a black shirt. The driver was also described as a Latino man in his 20s who was wearing a gray shirt, officials said. LA MIRADA — A motorcyclist died Wednesday after colliding with a van on Valley View Avenue, authorities said. The name of the motorcyclist was not released pending positive identification and notification of his family members, Los Angeles County sheriff’s Lt. Bill Evans said. He was initially described as a man in his 50s and believed to be a Whittier resident. The crash was reported about 8 a.m. on Valley View Avenue at Bora Drive, the lieutenant said. Rescuers took the injured motorcyclist, who was unresponsive, to the University of Southern California, Irvine, Medical Center for treatment, Evans said. He died from his injuries as 9:08 a.m. The motorcycle was southbound on Valley View Avenue when it collided with the van, which was making a left turn from eastbound Bora Drive to northbound Valley View Avenue, Evans said. The motorcycle was traveling at an estimated 15 to 20 mph when it struck the van broadside, he added. The cause of the crash remained under investigation, however no crime was initially suspected. Evans said the driver of the van, a woman in her 30s, was unhurt and cooperated with investigators. Anyone with information is asked to call the sheriff’s Norwalk Station at 562-863-8711. WHITTIER — A resident who arrived to find a burglar in her home Tuesday afternoon was punched in the head and knocked to the ground. Whittier police Lt. Randy Inman said the intruder fled with jewelry, laptop and other items but was later caught by officers. The 12:45 p.m. incident happened in the 16200 block of Honnington Street. Inman said a woman and her child came home and discovered a burglar at the house. The woman chased the man off the property, he added. “We started getting 9-1-1 calls about a woman screaming,” Inman said. 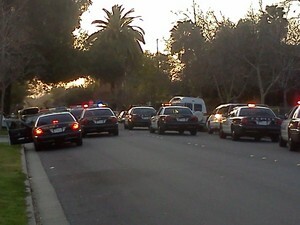 Officers spotted the man walking on Russell Street and Whittier Boulevard. Adam West, 30, of Buena Park was arrested on suspicion of robbery and burglary. West was being held at Whittier Jail. Inman said coins and other items taken from the house were found on the suspect. “He discarded the laptop and the jewelry in the trash,” Inman said. An armed man who was shot by West Covina police after a high-speed chase Sunday had his 4-year-old son with him during the wild pursuit in a stolen SUV, police said Monday. Freddy Silva, 31, allegedly drove the wrong way on the 10 Freeway, opened fire on police with a shotgun, and crashed into a house in Pomona, before he left his son and carjacked second car. He was then shot by police and remains hospitalized. Silva had been acquitted 10 days before on an assault case involving a firearm, police also said Monday. Lt. Dave Dolson of the Sheriff’s Homicide Bureau said Silva, whose last known address is in Claremont, was arrested on suspicion of attempted murder and remained in critical condition Monday at Los Angeles County-USC Medical Center. “He was shot once in the upper torso with a department-issued shotgun,” Dolson said. The Sheriff’s Homicide Bureau is handling the investigation because it is an officer-involved shooting. Dolson said Silva’s son is in protective custody with the Los Angeles County Department of Children and Family Services. He didn’t know where Silva was heading Sunday before encountering police. According to online court record and authorities, a Pomona Superior Court jury acquitted Silva on Feb. 16 of charges related to an assault case. West Covina police shot and seriously wounded a man Sunday following a wild high-speed chase to Pomona during which he opened fire on police with a shotgun, drove the wrong way on the 10 Freeway, crashed into a house and carjacked a second vehicle, authorities said. The suspect was taken to a hospital following the shooting, where he was listed in critical condition, according to Los Angeles County sheriff’s Deputy Tony Moore. Sheriff’s officials initially said the suspect had died at the hospital following the shooting. The shooting took place about 4 p.m. on Alvarado Street, just west of Park Avenue, officials said. The incident began about 15 minutes prior, when a police officer spotted an SUV that had been reported carjacked driving in the area of Temple Avenue and Amar Road in West Covina, West Covina police Lt. Alan Henley said. The SUV failed to pull over for the officer, initiating a pursuit at high-speeds. When the chase reached the area of Amar Road and Amber Valley Drive in Walnut, “The suspect pointed a shotgun out the window and fired at officers,” Henley said. The suspect was believed to have fired one or two blasts from his shotgun, police added. No officers were struck. The pursuit continued onto the 10 Freeway, where the suspect drove on the wrong side of the roadway into Pomona, Henley said. At several times during the chase, the fleeing driver pointed his shotgun back toward the pursuing officers and made “furtive movements,” he added. The fleeing SUV exited the freeway and crashed into a house in the area of Park and McKinley avenues, officials said. The suspect then allegedly carjacked a second vehicle, a white Honda sedan. Authorities late Sunday could not confirm initial reports from the scene that a child had been left behind in the crashed SUV. The white car rammed a police car before the pursuit came to an end on Alvarado Street, Henley said. The circumstances of what took place next remained under investigation, officials said, however an officer-involved shooting took place in which the suspect was struck in the upper body. West Covina and Pomona police swarmed the scene in the minutes following the shooting and shut down Alvarado Street in the area where the shooting occurred. Maria Hernandez, 40, said she was in her home when she heard a single gunshot and looked outside to see what was going on. She added the white Honda the suspect has been driving continued moving without a driver until it struck a curb. The wounded suspect’s name was not released Sunday. Witnesses said he appeared to be a Latino man in his 30s. As is common practice with officer-involved shootings involving Los Angeles County police agencies, the Los Angeles County Sheriff’s Homicide Bureau is leading the investigation, officials said.